There will be a live blog starting at 8:30. Check back all night. What else do you have to do? I'm pretty tempted to write "it's Florida, you know who they are," but that just won't do. 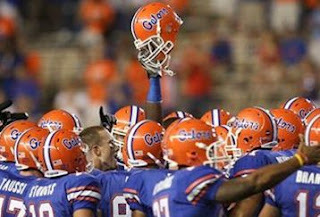 The mighty Florida Gators storm into New Orleans' SuperDome to play the Cincinnati Bearcats. Some are calling it the Urban Meyer Bowl since he attended UC. But, it became the Urban Meyer Bowl with the news last week that he was quitting, and then staying at Florida. Throw in the fact it's Tim Tebow's last game in the orange and blue, and it's going to be a symphony of Florida blowing on Fox tomorrow. The Bearcats lost Brian Kelly after it was announced they would play in the Sugar Bowl. New coach Butch Jones decided to stay out of coaching and let interim coach Jeff Quinn handle things. But, Quinn took the Buffalo job making things more confusing. With the Meyer stuff the last week, no one has talked about UC. So why even show up ya know? That was in sarcastic font because I think the 13 point underdog Bearcats can show the world something tonight. Let's compare the foes after the jump. The stats are pretty simple. Florida is a great, great defensive team going against Tony Pike and the Cincinnati offensive machine. It's going to be a styles clash for sure. I think the Bearcats can take this one down for the following 3 reasons. Florida has nothing to play for, Cincinnati has everything to play for. The Bearcats want to put a bow on the best season in school history and do it against the Gators. The Gators lost their national title game against Alabama. Last year in this scenario, Alabama was smoked by Utah. I know the Bearcats offense can score early, and that's the key. I see this game going one of three ways, and three ways only. The Bearcats come out on fire and put a couple of scores on the Gators and shell shock them. The final way I see this one going is a minor defensive struggle. Maybe a 13-10 score at the half and a final with both teams in the 20s. The Cats have their biggest challenge of the season on their hands and they have the talent to win. The UC fans ate up the tickets like they were Skyline, so UC should have some noise being made for them in the south. But, I don't think it's going to be enough. Florida is really good. I think the Cats fall behind by 10 or so early and chase the rest of the way. Unlike the Pittsburgh game, I don't think they catch up. Bonus prediction: I'll break my tv when the Fox announcers don't stop Teblowing Tim. I expected a much better performance by the Bearcats. They looked shell-shocked! http://ticketfront.com/event/Florida_Gators-tickets looking forward to it.